It's been about a month since Treasure and I started her fitness program. I'm so pleased with the progress she's made. 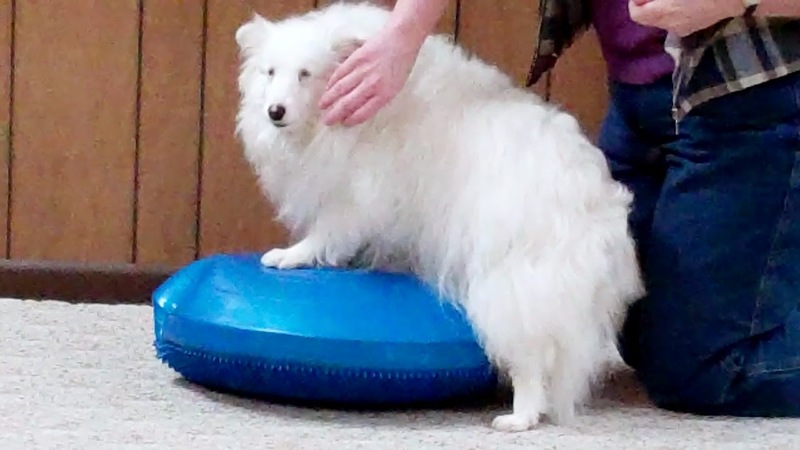 I'm taking a canine fitness class through Fenzi academy, so I've been able to learn more about how Treasure's muscles work to contribute to her balance and stability. I'm learning specific exercises that I can use to help strengthen those various muscles to help her improve her strength and stability. These exercises are helping with increasing Treasure's stamina and flexibility as well. Treasure is able to easily walk with me twice around the field by our house. When we started, we walked to the field and then went 1/4 of the way around and then came back. So, she has improved her strength and stamina nicely. I have noticed her core muscles are stronger, and she has more energy. She is always looking for something to do now, which is more like how she was before I allowed her to get used to a more sedate lifestyle. There are a couple ways to teach your blind and deaf dog to put her front feet up on a disc. First, please consult with a veterinary professional before embarking on a serious fitness program with your dog. If you don't understand the muscles and the exercises, and how to know when you've done enough, you can end up with a very sore and unhappy dog. If your dog has an injury or a condition which affects her structure and movement, it is vitally important to get feedback from a veterinarian about a fitness program before starting, so you know if there are exercises that may make the issue worse. When teaching your dog to put her front feet up on an object, choose an object that is fairly low and is stable. The object should not move when your dog steps up onto it. Remember that your dog has been using her feet to feel surfaces for a while now and stepping onto a moving surface may be scary. You want your dog's experience to be a good one, so she will want to continue to step onto the object for you. If she gets scared of the surface right off the bat, she will probably be more likely to avoid your teaching sessions. You can use a sturdy book, or if you have a large dog you can use a short step stool. Make sure the item is not going to move. You can block it with furniture or a wall, or even your foot, to prevent it from moving. When I first taught this, I used a combination of luring with food and shaping. I used food to get Treasure to line up with the object and when her front legs and chest were touching it, I let her eat the food from on top of the object. This allowed her to feel the object and learn its height, as well as begin to feel comfortable with it. I let her sniff it and continued to feed her food from on top of it. When she was fully comfortable with the object, I started to hold the lure a little farther from her over the top of the object so she had to lean forward to reach it. As she leaned forward, I watched for smaller behaviors from her to reward. When her weight shifted forward, she got the food. Then when she lifted one front foot, she got the food. Then when her front foot touched the object, then stepped onto it, then two feet up, etc. I added a touch cue to this behavior after she was doing it easily and was able to get rid of the lure, so she would easily step up onto the object when I gave the touch cue by itself. Then I started to ask Treasure to step up onto other objects that were varying heights but still did not move. We used this behavior for several tricks and for photo poses! Treasure loves to put her front feet up on things whether they move or not and she is often in position on her disc before I can even get myself situated. When first introducing her to a surface that would move, I used my leg. She was used to stepping up onto my leg for petting and cuddling. When she came up, I tensed and relaxed my leg muscles to cause just a tiny bit of movement under her feet. Because she was getting loving from me, she barely seemed to notice the movement. Then I made it into a game and started to move my leg more and more when her feet were on it and in different directions. She appeared to like this game, as any time I moved her off my leg, she stepped right back up on it for more! From there it was a simple matter to introduce moving surfaces to her. The disc in the pictures is a large one for Treasure's size. We have smaller ones that we started with. Also, the disc pictured is filled very full with air. 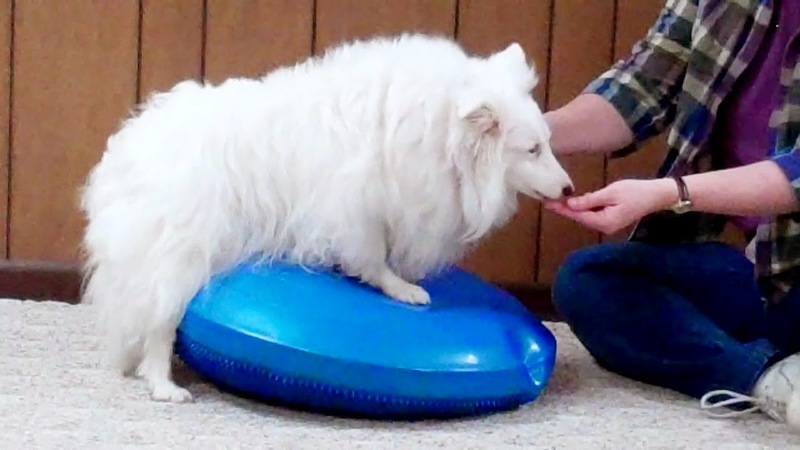 It is easier to start with discs that are slightly deflated, as they have less movement and are easier for the dogs to balance on and gain confidence and strength. Do not be fooled! Even though this seems like an easy exercise, don't overdo it! Try sitting on a disc while you're sitting at the computer for an hour and then see which muscles are sore the next day! It is hard work for muscles to work in ways they are not used to. Keep sessions very short and build up gradually. If your dog is sore, she won't be enjoying her lessons. Fitness is only fun if the participants are enjoying it!